Arjuna(Fictional Character): Krishna, the festival of Diwali has arrived. Housewives (Gruhlaxmi) are busy in cleaning and decorating homes. Businessmen are also busy in the market. Accordingly please explain, what should be done of old records of Books of accounts under MVAT and Income Tax Act, so that cleaning of business places can be done. Krishna(Fictional Character): Arjuna, in Diwali we should discard the old things and welcome the new things. Also Goddess Laxmi is extremely pleased with cleanliness and may stay for a longer time. See Arjuna, in business, many tax laws are applicable. Every law prescribes provisions for maintaining books of accounts and relevant records. Arjuna: Krishna, under MVAT (Maharashtra Value Added Tax) Act i.e. Sales Tax Act, how and for what period the books of accounts are to be kept by a dealer? Krishna: Arjuna, as per MVAT Act, a dealer should maintain all books of accounts and records, such as cash book, ledgers, stock registers, bank accounts, All purchases and sales bills, receipts of goods delivery, etc. These books of accounts should be maintained for 8 years from the end of the year to which it relates. For e.g. books of accounts of current year 2016-17 should be maintained up to financial year 2024-2025. Further if for any financial year, appeal or assessment is going on than the books of accounts should be maintained till the same resolves. In this Diwali the books of accounts up to the financial year 2007-08 may be disposed. Arjuna: What are the provisions under Income Tax Act for maintaining books of accounts? Krishna: Arjuna, as per Income Tax also, books of accounts such as cash book, Journal, ledgers, etc should be maintained for a period of effective 8 years I.E. 6 Yrs from the end of A.Y.. As per Income Tax Act, a person carrying on specified profession i.e. 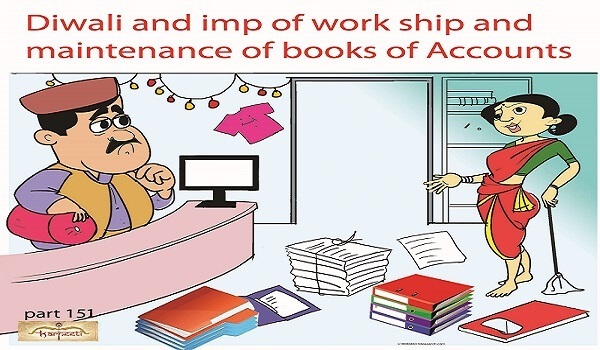 Doctor, Lawyer, Chartered Accountant, etc., has to compulsorily maintain books of account if, the gross receipts exceed Rs.1,50,000 in any of the preceding three years. For others, i.e. persons carrying on non-specified profession or businessmen, books of accounts are required to be maintained if, the gross receipts exceed Rs.10 Lakhs or income exceeds Rs.120,000/- in any of the preceding three years. Further, books of accounts are not required to be kept, if the person has shown income on presumptive basis u/s 44 AD @ 8% of turnover or u/s 44AE having transportation business. If the books of accounts and other documents are not maintained as required, then income tax department may impose penalty of Rs.25,000/-. Further if books of accounts are not properly maintained department may compute income on estimated basis. Arjuna: Krishna, what about the books of accounts maintained in computer software? Krishna: Arjuna, even if books of accounts are maintained in computer software, print out of the same need to be maintained. As per Income Tax Act the data stored on computer or pen drive or CD etc. is also considered as books of accounts. Officers can verify these devices. So always check the saved data regularly on external devices. In old days, changes were difficult as books of accounts were maintained manually. However now computerized data is easy to change, so beware of it. Arjuna: What is importance of books of accounts on the occasion of Diwali? Arjuna: Now days, why everyone is hardworking day and night for earning money? Krishna: Arjuna, Goddess Laxmi (money) is vibrant, for earning it good thoughts, good behavior, truthfulness, etc., is important in financial transactions. In today’s competitive world for finance, for earning more and more money human is working hard and has lost satisfaction. Keep in mind that, Money earned through proper means realizes good results. Whereas money earned through improper or unethical way leads to deterioration. But in this “Kalyug” this is forgotten. It is interesting to note that, to earn Wealth, a man loses his health, and at the old age to earn Health spends his wealth. One of Diwali Mantra says that “Shubham Karoti Kalyanam, Arogyam Dhan Sampada.” In this “Arogyam Dhan Sampada” conveys, people should earn wealth by keeping in mind health of his own and his family. On the occasion of this Diwali “May darkness of penal tax laws diminishes and the taxpayers life get enlighten”.